Everyone does dumb things, right? Over the years, I’ve learned lessons the hard way from these harmful household experiences. 1) Not cleaning the bottom of the stove right after a lot of food ran over the edge of the baking sheet and spilled over. The next time I used the oven, smoke billowed through the house and set off all the smoke alarms! 2) Not using larger, sturdier drop cloths the first time I tried to stain a piece of furniture in the garage. Permanent brown stain ran over the edge of the cloth and pooled beneath it while I was in the house waiting for everything to dry, and now – 12 years later – I still have big brown spots on my garage floor that will never come off. (Tried various cleaning products on it right afterward, to no avail…) And, on top of that, the project looked horrible and I ended up throwing the piece of furniture away! 4) Allowing my son’s then-teenaged friends to drink cans of soda in the living room during a youth group meeting there. A girl overturned a full can of red soda right in front of my fireplace, which permanently stained the wall-to-wall carpet there. Had to use a big throw rug over the spot for years until I eventually replaced the carpet! 5) Using a thick piece of plastic (instead of fabric) as a drop cloth at the top of a staircase. While home alone, straining my arm to hold a roller on a super-long rod to paint the ceiling at the top of a long staircase, my foot slid on the slick surface and my body wavered precariously back and forth. Thank God I ended up backwards instead of forwards — cause I came very close to falling down a long staircase! 7) Dripping bleach on the carpet. After we lost everything in Hurricane Hugo, we rented a furnished house an hour and a half from home, since everything closer was rented by other displayed hurricane victims. We’d recovered only a few possessions after our apartment a block from the beach was destroyed — and every day for weeks, when my toddler took a nap each afternoon, I’d go outside and bleach the few items we salvaged, trying to save anything I could. One day, I must’ve had bleach on something I carried in to the house, and when I looked behind me, there was a trail of golf-ball sized white bleach spots that had removed the color from the dark green wall-to-wall living room rug. I was horrified! Made a frantic drive 25 miles in to town the next day and bought every dark green marker I could find, to try to match the carpet color. One of them worked, and I “colored in” the white spots so the carpet looked normal again. I was an at-home mom, we were dirt poor, we’d lost everything we owned and the insurance company refused to pay, and we couldn’t possibly tell the landlord what happened and pay to have the carpet professionally recolored or replaced. That incident has always bothered me, since I’m a pretty honest person. But sometimes you have to do what you have to do… and I did learn from the experience. 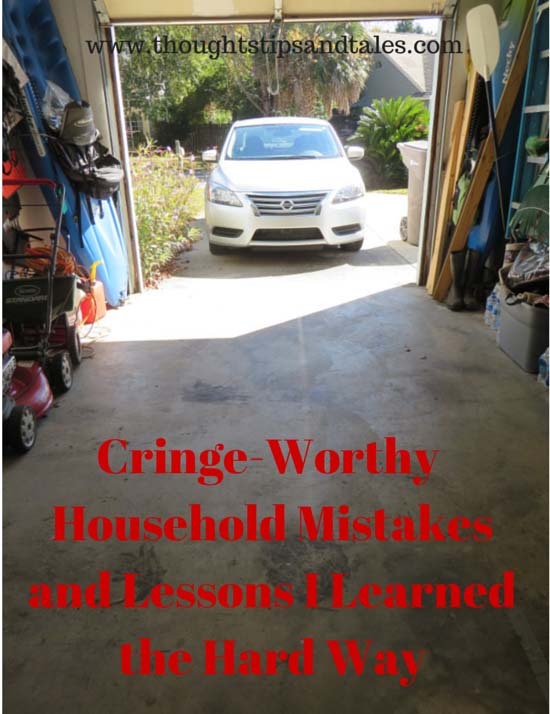 What household mistakes have led you to learn things the hard way? This entry was posted in dumb actions, harmful household experiences, mistakes, stupidity, thoughts tips and tales and tagged dumb actions, harmful household experiences, learned the hard way, mistakes, thoughtstipsandtales. Bookmark the permalink. Awwww. I think I made a couple of these mistakes myself. Sorry to hear about your loss from Hugo. I did the bleach thing too once…I was horrified too! I learned something from Don Aslett’s book years ago… he said that many times when we have an “accident”, we say “I knew that would happen!” He says, take a moment or two to avoid the accident in the first place and that has helped me a lot to take the extra minute to get the ladder or to pick up something that could trip someone, etc. I like standing on a paint can or other things as a step stool also… even though I know better and don’t do it as often now. 🙂 Thank you for the post. I’ve learned that nail polish bottles do break on ceramic tile and that the bottle holds an amazing amount of nail polish. I’ve also learned that while it may not last more than a day on my fingernails, it can survive thousands of flushes on the inside of your toilet bowl. Oh dear! Always remember things when we learn them the hard way, huh? I’ve done some pretty dumb stuff, like trying to use knives as scissors, or using them the wrong way when cooking. I tried to pry the pit out of an avocado a few months ago and ended up stabbing my hand right between my thumb and index finger, which I should have stitched up that night, but tried to glue back together (at the clinic the next day) instead. Yeah, that didn’t work. It took about two months before the nerves healed right and I could open my hand as wide as usual again without pain. Ouch! I always worry when cutting chicken with those super-sharp kitchen scissors. But stabbings are bad, too! Ouch. The bucket incident sounds brutal. Sometimes laziness doesn’t pay. But only sometimes! These are great examples. The foot thing is something I’d definitely be tempted to do. I’m impulsive about home projects and usually jump in when I really should assess what cost and time it will take! Thanks for linking up to Motivational Monday!